Rush guitarist Alex Lifeson has opened up about the severity of his arthritis – and bandmate Geddy Lee fears it’s the single biggest factor that’ll end their touring career. The Canadian giants are on the road in the US just now, on a trip they’ve stopped short of calling their farewell. It’s been thought that drummer Neil Peart’s desire to be with his family could be the deciding issue – although he’s also suffering from tendonitis. But Lee tells Classic Rock’s Paul Elliott: “For Alex the arthritis is not a small thing. If anything is going to mean we can’t tour any more like we used to, it’s more than likely going to be the arthritis – because that’s something that will directly affect his ability to play. He adds: “It kind of hurts me to see him when he’s having a bad day, physically. He’s one of my oldest and dearest friends. And when he’s been at rehearsal and he’s not playing his best, it’s not nice to see your friend suffer like that. Peart left Rush in 1998 after his daughter died in a car crash and his wife died of cancer. But he returned for 17th album Vapor Trails, released in 2002. 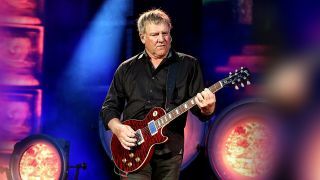 Asked about the drummer’s stated reasons for wanting to end the band’s touring career, Lifeson says: “I don’t know if sometimes he says these things because he doesn’t know how to come out and say that he doesn’t want to do it any more, that he’s tired of it, that he feels after 40 years that’s a pretty good run. “He shouldn’t have to feel bad about not wanting to do it any more. Now, more than ever, Geddy wants to play, whereas Neil probably would have quit years ago – if he didn’t feel that he owed something to us. “I think Neil knows that we’re not ready for the end, and he doesn’t want to ruin that for us. Keep in mind: we’re like brothers. I think he feels, as I would too, an obligation to us for having stood by him. Rush’s US tour began last week. They’re the cover stars of the latest edition of Classic Rock, on sale now and also featuring Faith No More, Scott Gorham, Muse, The Darkness, David Coverdale and much more.